I live in a rural village in Southeast Nebraska. My back yard is something of a haven, hidden from the street, where the birds feed and bathe and sing, squirrels bury black walnuts and climb the shepherds hooks to steal sunflower seeds meant for the birds, bunnies hop around and feast on the clover, and bumblebees hum as they drink from the flower blooms. There is no better time of the day than when I can just sit out there and watch and listen. A wider view of where the rock sits. 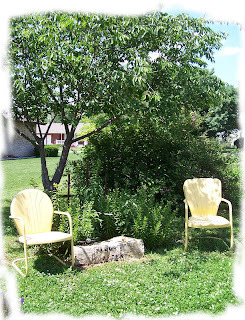 The old metal lawn chairs were garage sale finds that Jessi painted yellow. Behind them is the cherry tree and the weigela bush. Both bloomed profusely this year. Between the chairs you can see the asiatic lilies. They'll be blooming in the next few weeks. 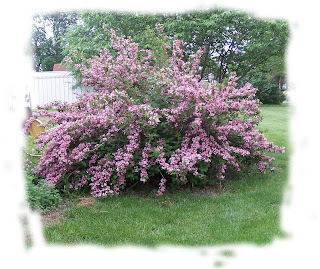 The weigela bush a couple of weeks ago. This photo was taken on the North side and shows the blooms. The bees love this! 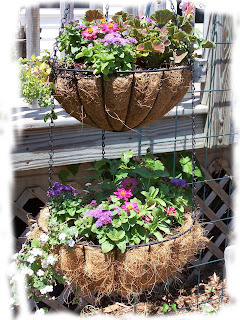 These hanging baskets just make me smile! They're filled with pink geraniums, pink zinnias, purple ageratum, and a little white flower that I don't remember the name of. Filling baskets and pots like these are a challenge for me to figure out what will look good together and if I'm putting too many or too few plants in them. I think this year it came out good! 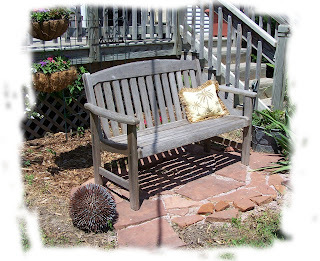 This photo was taken on Tuesday afternoon in the full sun, but by late afternoon this bench will be shaded and cozy. I love to stretch out and watch the wildlife while enjoying the flowers. The pillow is a tropical print from Goodwill. Behind the bench is a trellis where I planted a clematis. It's still very tiny, but will be lovely in a couple of years. On the far right of the bench is an old metal bucket planted with a neglected geranium I got on clearance - it is just now greening up again and I hope for blooms in the near future. On the far left of the bench is my nail ball (yes Michael, it's still here!) :o) I glued 16-penny nails to a bowling ball for a unique piece of garden art. 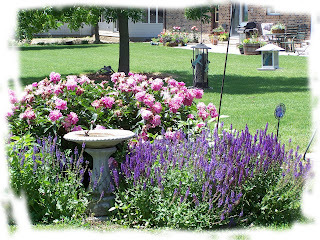 This photo was taken last week of the birdfeeding/bathing area, when the peonies were still pretty. In front of the peonies I have purple salvia. Under the feeders I'm letting sunflowers grow. There will be a little "forest" of them later this summer. To the left of the birdbath there is beebalm - it'll bloom in a few weeks. 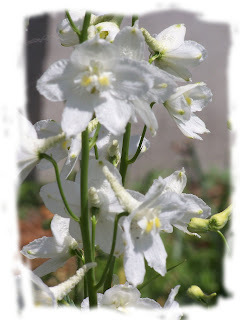 The white delphiniums bloomed this week. I love how delicate they are. Today I added two purple ones nearby. 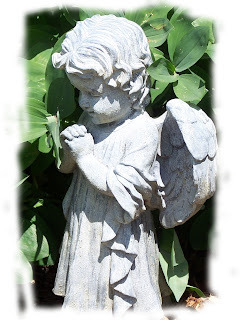 A little garden angel - she was a Christmas gift. She's snuggled up into the silver bells. 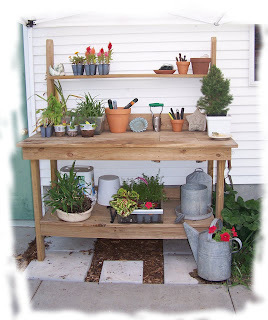 This is my potting bench. My DH designed and built it for me about four or five years ago as a Christmas gift. We recently moved it out of the garage so I will be able to use it more easily. You can see there are still several things sitting on it that need to be planted. In front of the bench is an old galvanized metal watering can filled with red petunias. This last photo is of my favorite project so far this summer, my tipsy pots. I first saw these online a couple of years ago and just filed the idea away as a "someday" project. This spring I found the perfect metal pole to stack the pots on, dug the large pots out of the garage, and got busy. It is planted with red petunias, pink wave petunias, and blue and white lobelia. The top plant is a pink version of the white flowers in the hanging baskets. I put them near the driveway where the sidewalk to the backyard begins and have had many positive comments from people who see them when they drive by. The neighbors love them - one more thing in my garden that makes me smile! This concludes my Summer Garden Tour 2008 - so far. I have so much more I want to show you as the summer progresses and I get more projects completed. 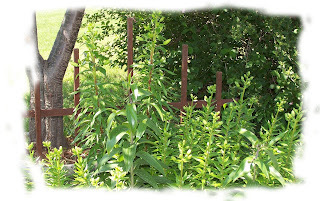 Please come back often and check out the changes in this backyard haven on the Great Plains! 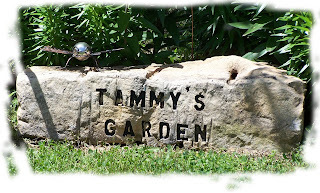 Hi Tammy, I just found your blog through the Summer Garden Tour of Tracey's. I love the tipsy pots and would love to try to make one of those for my place. Thanks so much for sharing that picture. It is so cute! Drop by for a visit at Katydids Kountry when you get the time. I saw a picture of the tipsy pots as well and plan to do mine in my shade garden with folage plants. (hopefully before the summer is over) I've been real busy working in the veggie garden and hauling mulch. With all the storms we had mountains of mulch all over town in empty parking lots and parks. Free for the taking if you haul it yourself. Come to kearney if you need some! Hi...I just came from the garden tour...you have a lovely yard! Living the good life on the Great Plains with my family. Blessed to be able to watch my grandchildren grow. "Someday" is not on the calendar and we need to live life right now. Do what you want to do, make memories with your family. Live well. Laugh often. Love much. That's how I try to do it.